2. 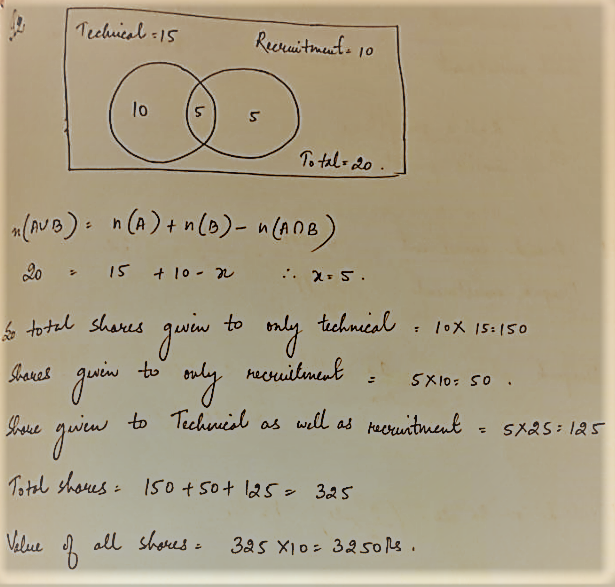 According to the stock policy of a company, each employee in the technical division is given 15 shares of the company and each employee in the recruitment division is given 10 shares. Employees belonging to both committees get 25 shares each. There are 20 employees in the company, and each one belongs to at least one division. The cost of each share is $10. If the technical division has 15 employees and the recruitment division has 10 employees, then what is the total cost of the shares given by the company?